The current account is the balance of trade between a country and its trading partners, reflecting all payments between countries for goods, services, interest and dividends. A deficit in the current account shows the country is spending more on foreign trade than it is earning, and that it is borrowing capital from foreign sources to make up the deficit. In other words, the country requires more foreign currency than it receives through sales of exports, and it supplies more of its own currency than foreigners demand for its products. The excess demand for foreign currency lowers the country's exchange rate until domestic goods and services are cheap enough for foreigners, and foreign assets are too expensive to generate sales for domestic interests. Exchange rate: As discussed earlier, a persistent current account deficit will lead to a fall in the value of the domestic currency. Another way is to draw on reserves, however if the reserves are run down to rapidly, it may cause a crisis of confidence and foreign investment may withdraw suddenly. 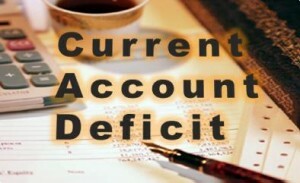 Persistent current account deficits will also lead to depletion of foreign exchange reserves. Indebtedness: If the combined balance is a deficit, then it would have to be covered by borrowings from abroad or attracting deposits from abroad. It might mean paying more interest. Increase in Interest rates: With a falling exchange rate, the government might have to take more serious monetary measures such as increasing the interest rates. This will attract foreign currency, however, the higher interest rates means compromising the Aggregate Demand in the economy. Another alternative is to attract foreign investments. However, it leads to greater outflows in interest and dividends in the future. These are policies implemented by the government that attempt to switch the expenditure of domestic consumers away from imports towards domestically produced goods & services. devaluating currency: Fixing the domestic currency value at a lower price and thus making exports more attractive. Moreover, imports will become more expensive, thus diverting consumption to domestic goods. Protectionist measures: Reducing imports by levying tariffs and setting up quotas. Please refer to problems related with protectionism. These are policies implemented by the government that attempt to reduce overall expenditure in the economy, so shifting the AD to the left. deflationary fiscal policies: Increasing taxes and reducing government spending. deflationary monetary policies: Increasing Interest rates. However, contractionary fiscal and monetary policies will lead to fall in Aggregate Demand, which is not desirable. This will result in compromising economic growth and higher unemployment. All of the above measures will also attract foreign investment in the economy, which will lead to inflow of foreign currency and improve balance of payment. Supply-side policy can provide a highly effective policy framework for long term improvement in competitiveness and current account performance. The main problem is that supply-side policy may take decades to work and is not a quick-fix. A current account surplus occurs when the country’s exports are more than its imports. This is a desirable condition, however it has its own problem associated with it. A surplus in the long run will lead to the appreciation of the country’s currency which will reduce its export competitiveness. Lower domestic consumption: Relatively stronger currency will induce people to go in for imported goods, thus harming the domestic consumption and investment. In the long run, it will harm the domestic industry and increase unemployment.